Anti Fed Ed Warriors, did you know there are 4 US Congressional bills which seek to globalize 2 distinct SDG (Sustainable Development Goals) agenda points in America? If not, that’s the topic for today’s article. Meet ‘sisters’ HR 753 and S 324 (Global Electoral bills) along with S 861 and HR 1857 (Global LGBTI* bills). What will these Bills mean for education, should they become law? Before we find out, remember, that I shared how HR 1 (For the People Act) has quite a few back doors into education with a UN (United Nations) agenda attached. As you know, the SDGs are the UN’s doing. HR 1857 and S 861: International Human Rights Defense Act of 2019. First, let’s define “LGBTI”: Lesbian, Gay, Bisexual, Transgender, and, Intersexual. Secondly, What Senators and Representatives running for President (or considering running) are sponsoring or co-sponsoring either of these ‘sisters’? When you look below, don’t miss the Trump Administration’s continuation of the Obama Administration LGBTI agenda. How did that happen? Fellow Warrior, Alex Newman explained in 2018, that Sec. Pompeo was the main reason. Third, these Bills basically use the U.S. State Dept.’s Bureau of Democracy, Human Rights, and, Labor to create a new government official position: LGBTI Envoy. If you’ve not read the Universal Declaration of Human Rights, the State Dept. has a copy. Warriors, on Pages 13 and 14 of S 861, I found this: ‘bilateral and multilateral fora’. What in the world is that?! Well, bi-lateral would mean two nations, or in this case, 2 groups agreeing to make across the board changes. Multi-lateral means many nations, or in this case, many people, agreeing to make changes across the board. Fora (related to ‘forum’) means a central meeting place. So, in other words, the programs, policies, funding, and whatever else relates to making changes at every level and in every corner for the LGBTI Envoy will be needed. This will not only impact Americans, but the citizens all over the world. On Page 17, you’ll see that all US federal agencies will need to devote money for programs for the LGBTI citizens here and those who are resettling into America from elsewhere. This will combine government at all levels, non-government groups, and faith-based entities. Page 18 shows you how the USAID will co-ordinate with the new Envoy. Warriors, as you know, I’ve shown you how the USAID is in the CCSS Machine, as well as the State Dept. Page 19 will reveal the data tracking needed to safeguard LGBTI citizens. For my fellow NC Warriors, Rep. Mark Meadows is a co-sponsor on HR 753. You may wish to ask him about his loyalty to the US, and the folks of NC. What will these Bills do? Warriors, basically, it’s the sense of Congress that we need to employ internationally recognized election ‘best practices’ into the ones held here, in the US. It’s also their sense that other nations can employ American ‘best practices’ in elections. Like the other pair of ‘sister bills’ (above), these Bills authorize the U.S. State Dept. of create and administer GEEP (Global Electoral Exchange Program). Like the two ‘sisters’ above, these Bills also create a unity between the State Dept. and USAID. How? In the form of awarding financial grants. Warriors, the U.S. Dept. of Education was not mentioned in either Bill, but we can pretty guess from the information we have that our students will somehow be impacted. The Americans traveling, as well as the visiting countries cannot influence elections; cannot meddle with legitimacy of elections; and, cannot study any election (local, State, or, federal) without official permission. Congress will also create a GEEP Alumni. After GEEP (should it become law) is in place, bi-annual reports must be given. No end date was given, so we can pretty much guess that HR 753/ S 324 mean to make this permanent. No price tag was given, but I can assure you GEEP will NOT be cheap. What type of groups are eligible for the GEEP Grants? Any group which defined by the IRS Tax Code of 1986, Sect. 501 (c) (3), as well as tax exempt under Sect. 501 (a). Warriors, do you see the danger of our REPUBLIC in these Bills? With all the problems our nation faces why must we see Congress place us in the center of every other country’s business? Do we really need every other country in ours? While securing humans don’t get attacked for what they are or how they believe, why is the State Dept. increasing in power and authority? As far as our elections? That needs to be within our borders, not spread across oceans. Since the State Dept. is enlarging (which certainly is not shrinking the federal footprint), we need to look at those leading the Dept. Why would Congress wish to make these plans? I believe it’s a way to seek more control over us, as citizens while globalizing our nation in some big ways. There are redistricting Bills which will feed off the ‘big Census’ (decennial) data. The next ‘big Census’ is in 2020. These will thrive on data collection and storage. If States cannot follow the federal mandates, then the federal government will step in and handle any redistricting measures needed. There’s also a House bill (HR 51) which will also redesign the nation’s districts/representation by making the District of Columbia into a State. This Bill has lots of support (203 co-sponsors; Reps. Ryan, Moulton, and, Swalwell are the 2020 Presidential hopefuls backing this) in the House. In the Senate, the identical ‘twin sister’ is S 631 (32 co-sponsors; Sens. Sanders, Klobuchar, Harris, Booker, and, Gillibrand are the 2020 Presidential hopefuls backing this version). Warriors, these Bills will also fully repeal the 23rd Amendment of the Constitution. We know that the 2020 Census has been beefed up to take more of our personal information than ever before. The redistricting Bills I’ve seen will prohibit States from redistricting in certain ways as well as tell them how to redistrict. Two of these redistricting Bills have the same name (John Tanner Fairness and Independence in Redistricting Act). The third is called the Coretta Scott King Mid-Decade Redistricting Prohibition Act. Warriors, if you’re concerned about seeing your State redistricted and told how to do it, I urge you to take the time to read HR 124 and HR 130 (John Tanner) and HR 44 (Coretta Scott King). These will literally impact your home, your family, and, your neighborhoods. If you’re concerned about the 2020 Census, I urge you to read the Census Bureau’s Planning Survey (released in Jan. 2019) as well as the Final Report on the focus groups used. You’ll find (Final Report) that education is considered a ‘soft quota data point’ on the Census. So, any question concerning education will be amassed to help community (local, State, and, federal) funding. With the grasp the CCSS Machine has on education, this is crucial. Warriors, if you look at the Operational Design for the 2020 Census, you’ll find that third party data partnerships are a reality. You’ll also see the Census Bureau is going to be pushing on-line participation rather than the old paper forms we have filled out. Much like those high-stakes assessments our students have, I’d say opt for paper & skip on-line. Let’s remember that the Census Bureau is housed in the U.S. Dept. of Commerce. This federal agency is also a CCSS Machine member group. In the President’s 2020 Budget, you’ll see their connection to education. Warriors, we also know the Census directly impacts funding and programs in your communities. HR 1451 (Community Service related) is called the “Keep Community Service Local Act”. Now, the odd thing about this Bill is that it prohibits States from ending their Corporation for National and Community Service office UNLESS the federal government approves it. If you’ve not heard of this corporation, you may know it by some of the programs it oversees, AmeriCorps, Senior Corps, etc. 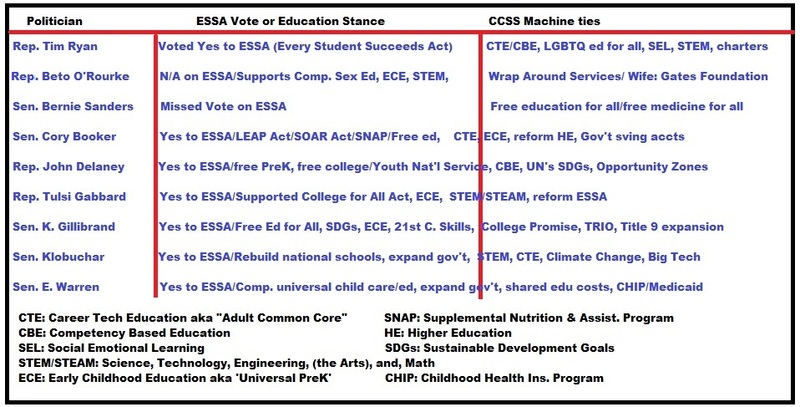 I’ve shown you how these are CCSS Machine aligned and will fit into ESSA (Every Student Succeeds Act). How, is THAT State sovereignty? How is THAT local control? Think about this way, ESSA mandated that communities align their efforts to ‘student achievement’. Also, community service projects are key to some education programs. By having a national “Mother, may I?” bill hardly seems it’s geared for the citizens. But, then ESSA wasn’t geared for the students, teachers, or, taxpayers either. Warriors, are you seeing the circle around your community shrinking? I hope so. 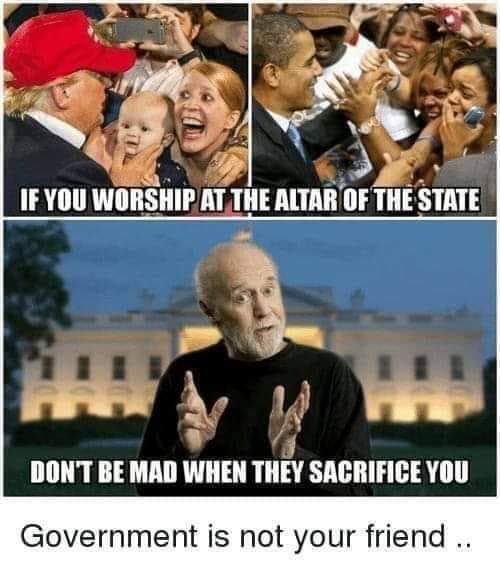 The government is NOT our friend. It’s not our protector. Government isn’t even listening to us. As I said in my last article, a full mode of civil disobedience is in order. We cannot allow DC to manipulate us in the ways these Bills are being considered. We have a charge to take down our government when it ceases to be about “We the People” and becomes about ‘We the Corporate Minions’.